In preparation for liftoff of space shuttle Discovery on the STS-133 mission, the six-member crew flew to NASA's Kennedy Space Center in Florida to conduct the prelaunch training and countdown dress rehearsal, officially known as the Terminal Countdown Demonstration Test. The last crew of the space shuttle Discovery staged a fulldress rehearsal today (Oct. 15) for the spacecraft's final voyage, capping thelaunch practice with an emergency escape drill NASA hopes never to use. The six astronauts slated to launch on Discovery's finalmission Nov. 1 arrived at NASA's Kennedy Space Center (KSC) in Cape Canaveral,Fla., earlier this week to participate in training exercises, known as theTerminal Countdown Demonstration Test. ? "The vehicle is looking great, all of our activitiesare going great," shuttle commander Steve Lindsey told reporters yesterday(Oct. 14) from the Launch Pad 39A at KSC. "We are basically trained andready to fly. Just a few more weeks of activities we have to go through, andthen we'll hopefully be back here for an on-time launch on Nov. 1." 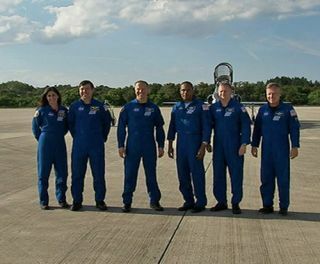 Lindsey 's crew includes pilot Eric Boe, and missionspecialists Michael Barratt, Nicole Stott, Alvin Drew and Tim Kopra. They flewto KSC from NASA's Johnson Space Center in Houston to participate in varioussimulated countdown activities, including equipment familiarization andemergency escape training. While at KSC, the astronauts checked the fit of their orangespacesuits, reviewed firefighting methods, familiarized themselves with theflight hardware, and examined the cargo that will be hauled to the spacestation in Discovery's payload bay. The crewmembers also received training on how to escape intothe launch pad's slidewire baskets and armored M-113 personnel carriers in theevent of an emergency pad escape. The exercises are intended to familiarize the crew with the varioussafety equipment and procedures that, if necessary, may need to be put intoaction on the day of launch. On its final spaceflight, spaceshuttle Discovery will take critical spare parts to the station, includinga storage room and a humanoid robot helper to assist the crew of the orbitingoutpost. But, even with the excitement surrounding the upcomingmission, Lindsey calls the preparations for Discovery's final flight abittersweet experience. "For me personally, this will be my third flight onDiscovery," Lindsey said. "Discovery is a workhorse ? fleet leader innumber of flights. It's a great machine, a great vehicle. As far as the lastflight, it's a privilege for us to be able to fly it on the last flight. It's areal tribute to the folks here and at the other manned spacecraft centers forall they've done to keep these vehicles flying and being able to do all thethings they do." On Monday (Oct. 11), President Barack Obama signed a majorNASA act that turns his vision for U.S. space exploration into law. The NASAauthorization act scraps the space agency's previous moon-oriented goal andpaves the way for a manned mission to an asteroid by 2025. A manned mission toMars is envisioned for some time in the 2030s. Still, the legacy of Discovery will be celebrated by the STS-133crew during their upcoming mission, and after the orbiters are retired, thepublic will also be able to share in the illustrious history of the spaceshuttle program. "Our ship Discovery was named after several predecessorships, also named Discovery ? all ships of exploration," Barratt said. "It's a culmination of a great heritage. And we hope there are futureships bearing that name. We will be carrying a medallion from the Royal Societythat was struck in honor of Captain Cook. On Cook's third voyage, there was aship called Discovery, and that's the main ship for which our ship Discoverytook its name." POLL:What Do You Think About NASA's New Direction?